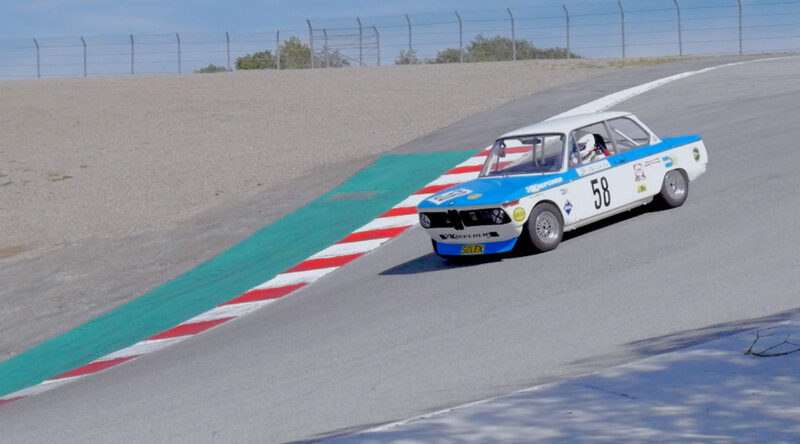 We made the trip down to Weathertech Raceway Laguna Seca the weekend of March 16-17 for the HMSA Spring Race. It was a great weekend with lots of sun and fun. We took the Koepchen 2002 and my new Swift DB2 S2000 car for this event. There were enough S2000 cars so that we had our own group. The 2002 was put in Group 5 which had a couple of other B sedans, an open wheel car, and a bunch of big bore Corvettes, Cobras, and Mustangs. We made a change to the K2002 over winter that we hoped would make it quicker. We softened the springs from 400 lbs. down to 350 lbs. It made for slightly more body role in the corners but also increased the grip noticeably, as well as making the car feel more into the track. This was my first drive in the Swift. I do fit in it a whole lot better than I did in the Chevron. There is a lot more leg room and room in the pedal box for my big feet. I did have a problem during the first practice with the car jumping out of 3rd gear whenever I let off the throttle. Jim tried adjusting the shift linkage in an attempt to fix it. However during the qualifying race on Saturday it was still doing it. 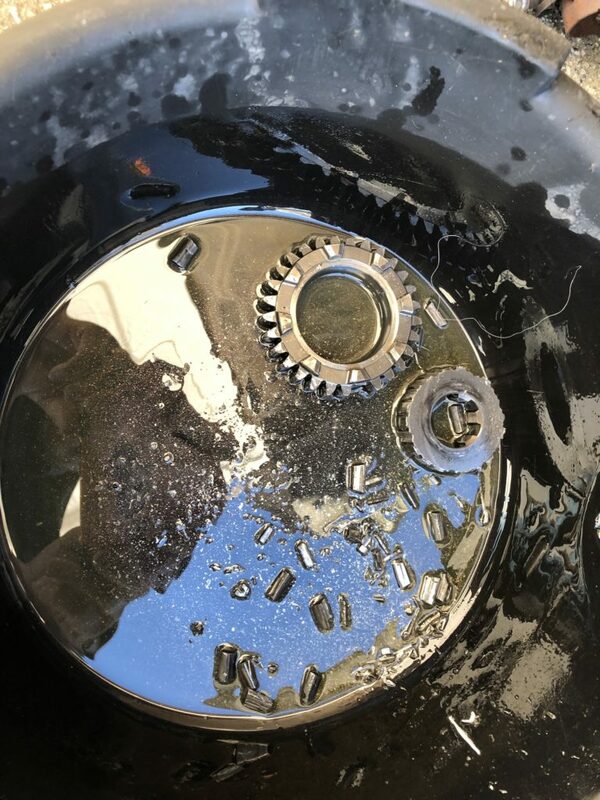 A pan full of 3rd gear! This put an end to our weekend in the Swift. About half way through the race I shifted from 2nd to 3rd coming out of the Corkscrew and 3rd gear stripped completely. At the end of the day Jim pulled the transmission cover off and found a bunch of teeth and bits in the bottom of the case. We parked the car for the weekend. I did manage a 1:44.6 during the race. Not stellar, but ok for my first time in the car. I had a much better run in the 2002. The softer springs helped a great deal. My best lap last year at this event was a 1:49.7. My best lap this year was a 1:46.9! Both races went about the same. I started 2nd in the Saturday qualifying race and finished 3rd. In the feature I started 3rd and finished 3rd. I ran pretty much alone in both. All they got for their trouble was my son’s dirt laundry. The only bad thing from the weekend was that our car was vandalized on the way home. 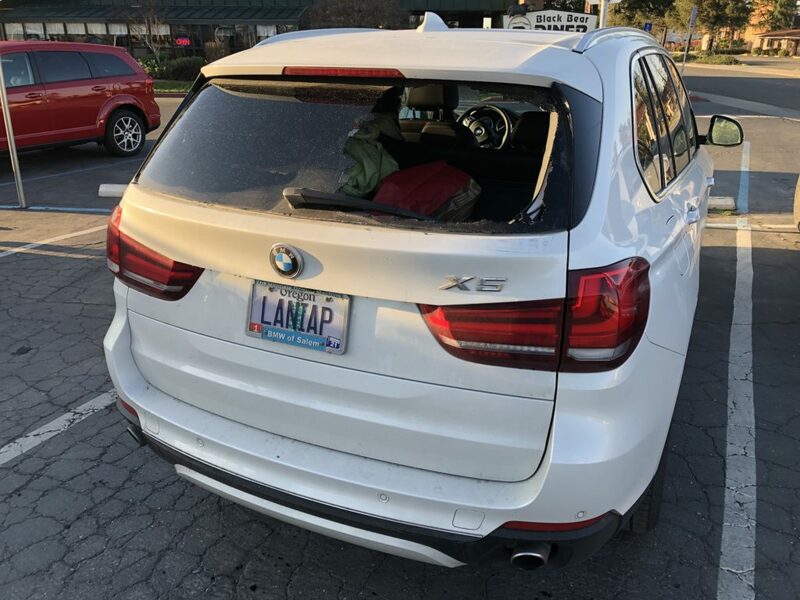 We stopped to have breakfast in Willows and while we were eating some low-life smashed the back window in our X5 and stole our son’s backpack. We were happy they didn’t steal any of the cameras, but it still makes you feel violated.